Today we’re going to talk theory – specifically, how to key signatures. I am going to show you a music reading trick that blew my mind when I first learned it. I don’t usually throw around big phrases like “in the world”, but when I do, it’s because there’s some serious mind-blowing power involved. If you’re into music theory, you will appreciate this. If you’re just a casual musician who has to look up a key signature every time you learn a piece, you’ll appreciate this too. A shout-out to my music theory teacher, Doug. I definitely didn’t come up with this on my own – he showed it to me, and I have since showed it to many of my students. 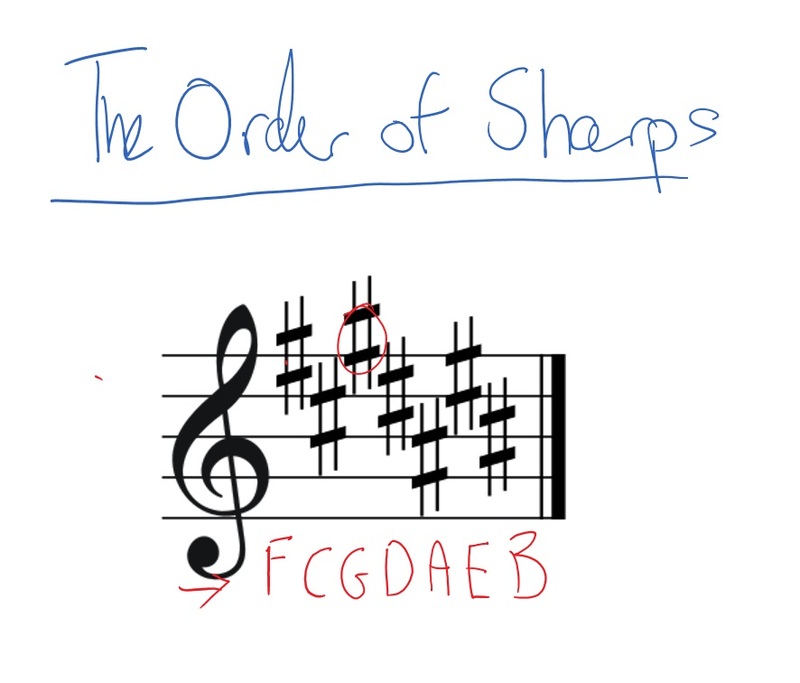 Do you remember last year, we did the video on “The Order of Sharps”? It’s okay if you don’t. We’ll summarize the content here, because it’s going to help us make sense of this trick on how to read key signatures. Please bear with this short-ish explanation, because the actual application of this is very fast. I just want you to understand the building blocks. Basically, whenever you see sharps (or flats) at the beginning of your piece in the key signature, they always follow the exact same order. You’ll never have a piece with just a G# – if it’s got a G#, it’s also gotta have the sharps that come before – F# and C#. “Father Charles Goes Down and Ends Battle”. Another way to remember them is that each letter is a 5th from the other. F to C is a 5th, C to G is a 5th, and so on. Okay, so let’s figure out this trick! I’ll show you by example. So we’ve got a key signature above with three sharps. It has three sharps: F, C and G.
Then jump ahead one spot – to A – and that letter is your key signature! The key of A has three sharps – F, C and G.
And the letter beside that is the key signature of our piece. B! What if your key signature was completely blank? We cross a letter out, and then the letter after that is our key signature. No sharps = the key of C! Isn’t that amazingly simple? We can use the same trick for key signatures with flats, too. We just have to flip everything around, and do it in the reverse order. After going backwards once, I’m left with my key signature – E. But not just a plain old E – Eb. 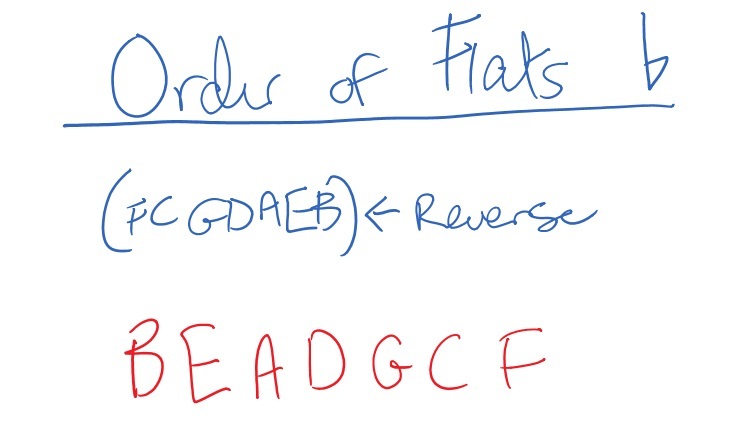 With the flat key signatures, every one of the keys must start with a flat – like Db, Gb, and so on. If they have no flats in the title, they’re almost certainly a key signature with sharps. Let’s do another example of! And the letter next to that, D, is our key signature: D flat. So let’s review this all really quickly. Say you had your order of sharps all listed out, and you wanted to figure out what the key of D major is, and what the sharps are. Find your D, move backward a note, and the remaining letters are your sharps. Let’s do that with flats. You’ve got your flats all listed out, and you want to figure out what the key of A flat major is, and what the flats are. You find your A, and then add the note in front of it (as well as all the ones behind it). These are the flats in the key of Ab. There is specifically one exception I want to point out, before I leave you to ponder this. It has to do with the key of F major. See, the key of F major has a flat in it. Specifically Bb. But F major is the only key with flats that doesn’t actually have a flat in the title, like “B flat” or “G flat”. It’s just “F”. So how do we figure that one out? Just to make sure we’re covering all our bases, I want to talk about key signatures with sharps in the title. They do come up from time to time. Okay so say you want to figure out the key of F# major. Yes, it’s a weird one. But you can do it! 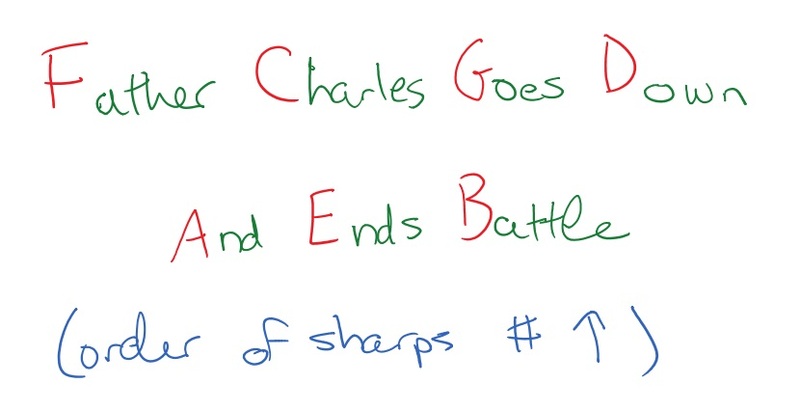 All you have to do is start rewriting the order of sharps, like so. So yes, the key of F sharp major has six sharps. If you’d like more theory information along these lines, definitely check out the video I did on major and minor keys, and how to tell them apart.